Kuala Lumpur, 23 June 2018: How does an online platform that is ever thriving and growing, evolve? It starts having a physical presence. That’s exactly what CARING MOMS did. In line with their steady growth over almost 2 years, this online platform group which has been benefiting women folks in many different ways launched their physical Community Centre at the Sunway Nexis, Kota Damansara on 23 June 2018. 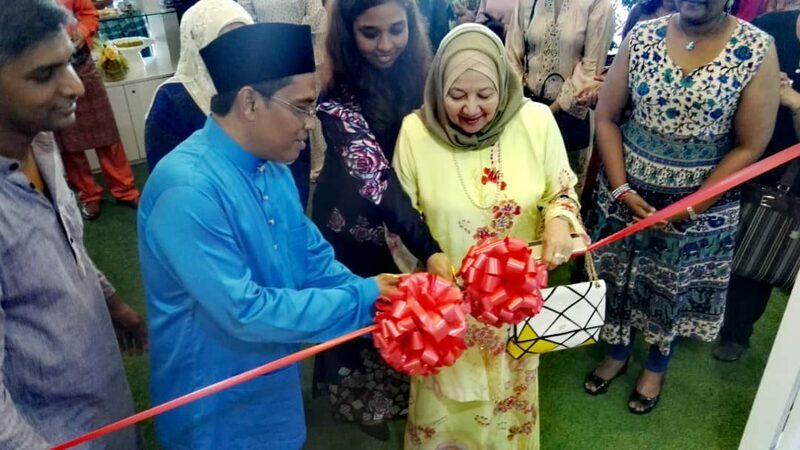 The Community Centre was launched by YB Tuan Hj Shatiri Mansor, ADUN Kota Damansara. The launching was held in conjunction with CARING MOMS Hari Raya celebration attended by its members. In his speech, YB Shatiri said, “CARING MOMS is a very good Organization,” and he was awed at the presentation and the community spirit displayed by the members. The Community Centre will serve as a draw point for events conducted by the CARING MOMS platform. It is also opened for rental for various occasions such as Fitness Programs, Children’s Workshops, Cooking Classes etc. “The Community Centre can act as an event venue for functions too. It comes complete with a list of caterers and decorators as well,” said Major (Retired) Shera Ann Bosco, Co-Founder of CARING MOMS. “We only allow caterers who are registered on our platform to supply food for events to be held at the Community Centre, this ensures quality and exceptional service are provided to our clients. It also gives an extra avenue for our sellers to supply their specialties for these events. As most of our supplying caterers are homemakers, this creates an additional revenue channel other than those gained from our online platform,” she further said. The Community Centre will also have a physical showcase of the members’ products on display. ‘Before this, I sold my products via the CARING MOMS Facebook page. After that, once their online shop was opened, I was able to sell there as well. But now I am so glad that my products will have a physical presence in the CARING MOMS Community Centre. Now my clients and prospective clients can pick up my products themselves,” said Gladys Lee who sells variants of homemade Ginger Powders. Just like Gladys, many other women made up of homemakers, single mothers or some who are taking care of their elders will now be able to showcase their products directly at the Community Centre without having to go through a middle person. “Everyone who sells their consumable products at our Community Centre has gone through Food Handling courses and have received their typhoid injections. We have been running this Health Ministry accredited Food Handling Certification as well as the immunization course, since April 2018. To-date 300 members have attended the course. We have the course scheduled up to August 2018 and intend to have it ongoing’” said Shera. Other than consumables, the public can browse through craft products like handbags, hair accessories and party products, as well as beauty products such as homemade shampoo, hair serum and oils, facial products and ayurvedic healthcare products.